Message Crafting. 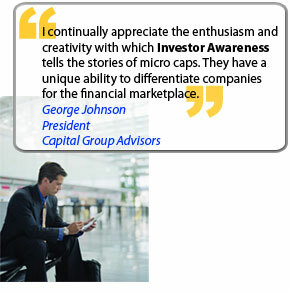 Investor Awareness helps companies tell their stories in ways that enhance the interest of the financial community. We recognize the importance of demonstrating vision, and of showcasing management ability to deliver results. We craft news releases, corporate profiles, media materials and investor kits that engage the financial marketplace. Focused Outreach. With over 10 years in business, Investor Awareness has built a powerful network of financial professionals who look to us to learn about new investment opportunities. We introduce our clients to qualified U.S. and International retail stockbrokers, investors, analysts, market makers, portfolio and fund managers through road shows, one-on-one meetings, direct telephone conversations, presentations and seminars. Extended Outreach. To extend the reach of our clients’ messages, Investor Awareness arranges teleconference calls, web broadcasts, fax and email broadcasts, and initiates media relations campaigns in order to reach the widest possible audience. Support and Follow Up. Creating awareness in the financial marketplace requires ongoing activity and effort. Investor Awareness excels in this area: efficient and effective follow up ensures that messages continue to reach the intended audiences.